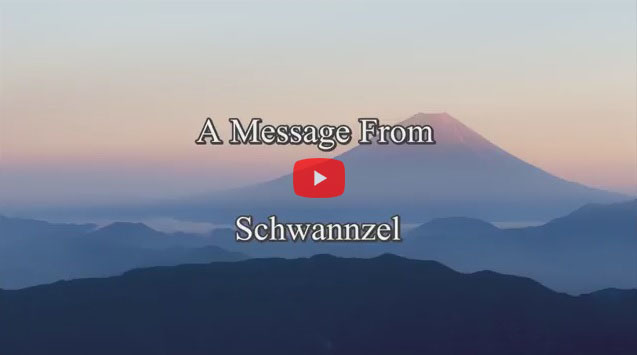 Schwannzel is one of the archangels in the highest stage of the eighth spiritual region of the Earth. He is working in the political matters with Archangel Uriel. Born as Solon, one of the seven sages of Greece, in around the 6th century BC, he founded Athenian democracy. After that, he was born in Japan as "Syoutoku-Taishi" (Prince Shotoku) in 547 A.D. He played an important role to promote Buddhism in Japan, and made great effort for making the national base of Japan by establishing the Twelve Court Rank System introducing the system of the bureaucracy, strengthening the centralized system of the Emperor, building up the Imperial military power by planning the expedition to Shilla, and proceeding Japanese foreign policy by dispatching the Japanese envoy to Sui Dynasty China. Also he is famous for his establishment of "Seventeen-article Constitution" with forewords, "Harmony is the greatest of virtues". Also he was born in the United States in 1809 as "Abraham Lincoln", taking out Emancipation Proclamation in 1862. The words of his Gettysburg Address, "Government of the people, by the people, and for the people" is famous. " I am Schwannzel. I might be called as Shotokutaishi in your country. But, today I have come here as Schwannzel to explain about the plan of God in heaven and the mission I have been in charge for many years to fulfill the role of Japan. Once Buddha foretold to be born again in this land of Japan called Kentomati of Jabdova (Tokyo of Japan), I am a person who have been coping with the plan that will be performed as it is, and in order to make this Japan the birthplace of the final divine truth, I have been managing to arrange this land of Yamato and make it into the magnetic field of God. In Japanese Shinto, there is originally the statement, "Make harmony a principle," but in order to root the higher religious mind for pursuing God in the people, therein uniting the people's minds by making harmony a principle, I have been planning to introduce Buddhism, Christianity and the like in a step-by-step fashion, not just Japanese Shinto. It is finally the time to become the place where originating the world religion through which the one called Buddha El-Kantale unites all the religions of the world to one from the local ones. If those various religions have not been rooted in this land of Japan, if there are not any component, environment in which the ones can learn from the other religions, I think it would impossible for those who are supporting El-Kantale to prepare mentally by themselves. Therefore I have been pushing out in each of the steps Buddhism after Japanese Shinto, Christianity after Buddhism, and in parallel releasing this land of Japan to the western civilization through Meiji Restoration, and sending out many excellent men so that this land can take the leadership in the engineering and economics. I have been bringing up Japan to such a country capable of leading the world. It has been moving under such a plan, and I am the one most in charge of it. If you think about my feeling as someone who has been undergoing hardship in the flow of the part of the plan of God and preparing this breeding ground of Japan, please lend us your help in becoming the country of the lighthouse, the torch of light, which sends out this divine truth all over the world. And I wish you from my heart to lend us your assist as you those who can fulfill the missions of the maximum level originally given to this country Japan, the country Yamato. Now Buddha is doing a great deal of learning, and there will come a time when what he is learning now will be fed back to his capacity of leadership. I think so. If it is so, when going down to the ground, you may be saying, "It doesn't mean everything is so easy," "There would be various temptations and various dangers," "You could be aware of it, looking over the ones at the Meiji Restoration. There haven't been so many who have lived their lives fully." However, those who vowed, "Yes, we will do," and gone down are you. There have been embedded those who could necessarily sense spiritually in various places. Therefore, though they wanted to be born in Japan, actually they are angels of light who had to be born in countries other than Japan. And they have been waiting for the word of God, originally the word of El-Kantale, in order to light the torch of God in its individual country. It already has been past the time to fulfill their mission. While they are still alive and understand the meaning of the word, please send out these messages. Once there was the Berlin Wall in Germany. There was a history in which the country had been separated into East Germany and West Germany, and the people could not go back and forth. If someone were to go across, he would be shot. But the time came when the Berlin Wall was broken, the people went back and forth as if usual, and the people of East Germany and West Germany are now living in peace uniting the race originally, aren't they? This could not have been considered a decade ago. Now it is a matter of course. The same thing could be done. With a border like a high, high wall, people lived separately, opposing each other as different, hating each other and struggling for their own interests. Originally, the children of God are one race, namely the humans living on the earth. They are the earth humans. It is wrong to make borders originally. Remove such high fences. Take off such high walls. Gods are conveying to you such things now varying their individuality. But the present people would insist loudly, "We cannot do such a kind thing," and "It would be impossible to remove the borders," "Under the united government of earth, under the united religion of earth, under the love of God, it would be impossible for the earth to become one, become the earth utopia, and be reborn as a star of love." But it is possible. Only those who have made that possible evolution and development can join the companions of the cosmic civilization. There are stars that have been proud of their high civilization, going through such a process of development and evolution. In that process, in the history of the cosmic-level reformation, how much time have we spent to change the earth into such a united star of God, and to fulfill this mission to achieve the final utopia from this Japan? For that purpose, I have been given the responsibility for this country Japan. It is not that we are insisting on self-realization by making the country of Japan the one leading the world, or to bring everything together as a realm of God being imposed from above, but it is a part of the orthodox flow of the evolution of humankind at the planet level. In that flow, it is the time when the earth will enter such a matured phase. That is, God is the law of love, the providence of love itself. And as part of that providence, each of us is made alive in love. To forgive each other, to each other alive, to take hands with each other, in the grand harmony, in the law of the grand harmony of love, in the planet of a star called this unit of earth, when the people are going to make a large ring taking hands as one, that is when this earth will become the realm of God and the star of love will be realized.